Visitors to London will discover that we are in one of the most sought-after residential areas in Central London. Clients often ask us where we recommend for lunch or dinner after their appointment. Of course, we always advise them to come for their massage on an empty stomach, but after their appointment, they have a huge choice of nearby restaurants and cafes as well as tourist attractions. There are so many cafes and restaurants nearby, we are really spoiled for choice. Our masseuses are constantly slipping out to get a coffee from Starbucks, and Sainsbury and Waitrose are just nearby for lunchtime grocery shopping. 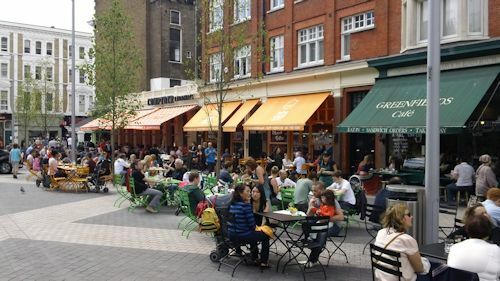 Or, a little further away, on Kensington High Street with its upmarket shops, you can find the largest Wholefoods Market in London, with several restaurants on its first floor. There are also less pricey but also excellent restaurants, depending on your taste – The Lotus Garden an excellent Chinese restaurant near Earl’s Court Road tube station, and the Papaya Tree in Kensington High Street, which is an outstanding Thai restaurant, which until recently was a well-kept secret among Kensington residents. You just have to walk along the Gloucester Road to find dozens more eateries, cafes and bistros. A little further away, around the corner from South Kensington tube station, on Exhibition Road, there is a delightful square with ten or more cafes and restaurants, where in the summer you can sit and eat at outside tables in the open air and you will feel that you are sitting in some mediterranean resort, rather than in the centre of London. That square is 5 mns walk from some of the main London museums: the Natural History Museum, the Science Museum and the Victoria and Albert with its great cafe, where you can also sit outside in the summertime. These museums are great to visit with children and they have gift and souvenir shops where you can buy presents to take home. Another nearby place for gifts and souvenirs is the King’s Road in Chelsea, which was the centre of Swinging London in the 1960s. Today, it is the home of the Saatchi Gallery and also the hub for the popular television series: ‘Made in Chelsea.’ You can often see the actors from the programme meeting up at the Bluebird Cafe and other popular bars and restaurants on the Kings Road. However, if you would just like to chill out after your tantric massage, you could go and sit in some greenery and breathe some fresh air. Holland Park and Kensington Gardens are both just 10 mns walk away. In Kensington Gardens, you can see Kensington Palace which used to be the home of Princess Diana. You can then take a walk towards the Albert Hall and the Albert Memorial along a lovely route in the park with the most beautiful scented flowers and park benches where you can sit and relax, breathe deeply, feel the bliss and take it all in. If you do need to get a taxi, there are plenty on the Cromwell Road. Alternatively the no. 74 bus goes all the way from the Cromwell Road to Oxford Street, via Knightsbridge and Park Lane. I always think that travelling by bus is so much more pleasant than the underground, but it can take a long time during rush hour, between 5-7 pm in London, when there is too much traffic on the roads. Luckily, we are situated near Gloucester Road and Earl’Court Underground Stations, as well as High Street Kensington tube, so we are well served by the Picadilly Line, as well as the Circle and District Lines. For more details of Kensington sights and hotels, here is a useful guide.